The 10-day haul of RMB 76.3 million (USD $42 million) of RoboCop in China spells major challenge for Imax, as it affirms the arrival of its biggest potential rival on the large format (LF) and 3D scene in China and possibly beyond. Much like Robocop vs. Enforcement Droid Series 209 in the original film, this will be an un-even match where the largest firepower will not necessarily win out over the smaller new rival. As LA Times notes, “Jose Padillha’s remake may yield more in China than it has in the U.S. and Canada, where it has made $54 million since its mid-February release.” A large portion of this comes from the cinemas showing it in 3D (the only country in the world to show it this way) and on large format screen – though crucially not Imax screens but ones from China Film Giant Screen (CFGS). In order to understand the challenge that CFGS poses to Imax it is important to know a bit about the history of LF film and cinema. The format was effectively invented by Canada’s Imax and showcased at the 1970 Osaka Expo. Because of the inherent limitations of 70mm films, feature films were not practical, which is why it tended to focus on documentaries about Africa or Space Station for school classes and museum visitors. Imax’s only real competitor during this time was Iwerks Entertainment, though the latter was mainly focusing on specialty venues and virtual reality theatres. In 2001 Imax was nearly wiped out by the spate of Chapter 11 bankruptcy protection filings from US cinema chains that saw long-term deals with the Canadian firm cancelled. Imax slowly re-built itself with a focus on feature films and courting Hollywood for first-run releases converted for the LF screen using the in-house DMR process. Imax struck gold with Polar Express in 3D and soon started focusing more on multiplexes while rolling out new digital projection technology that did away with the 70mm limitations. Because many cinema chains objected to Imax’s terms, they created own-brand LF screens, with names such as Cinemark’s XD, Regal’s RPX, AMC’s ETX, Carmike Cinemas’ BigD and VueXtreme. 3D vendor RealD also tried creating a unifying brand with the Luxe. However, none have created the same inelastic demand at a premium pricing point that Imax achieved. Then along came CFGS. CFGS is challenging Imax on two fronts with the RoboCop release. The first is the 2D-to-3D conversion, which was undertaken in-house by Cubic Pictures for a China-only 3D release. Montreal-based Imax claims that former employee Gary Tsui stole trade secrets that led to the creation of China Film Giant Screen (CFGS), an emerging player in the large-format screen industry that Imax dominates. CFGS entered the playing field in 2012, showing off its products at the Cannes Film Festival and promising to disrupt the Imax “monopoly” by offering bigger big screen technology on a budget. Further infuriating Imax executives is another entity, Beijing Cubic Pictures Technology, which converts large-format video to 3D by allegedly copying Imax’s 2D to 3D conversion methods. The company filed suit against Tsui last August. However, 2D-to-3D conversion is a well established process by now. not just Imax but also by the likes of Prime Focus, Legend 3D and StereoD have converted dozens of films, so it will be interesting to see what ‘secret sauce’ Tsui allegedly “stole” that is different from how others do it. Imax legal case could potentially be undermined by the precedent set by Disney’s loss against RealD in acquiring conversion patents from 2D-to-3D conversion pioneer InThree. Speaking at last year’s Berlinale, RealD’s Bob Mayson stated that the company acquired the patents to protect the stereoscopic conversion business from so-called ‘patent trolls’, rather than extracting licence revenues. Both sides in the current dispute are no doubt studying this case closely. Digital cinema in China, quietly spent decades scene, the film’s digital, from industrial development is moving towards prosperity. China has experienced filmmakers attempt to explore, from the experimental to the practical, from the introduction of integrated to independent innovation, a film screening marks the high quality Chinese giant screen system was finally born. “Chinese giant screen” projection system independently developed by the Chinese people, 100 percent with independent intellectual property rights, after nearly three years of research and development and technical research, the Chinese giant screen has no way inferior IMAX, IMAX China is not only to enhance the brightness of the screen for a while using dual projection, which includes digital cinema mastering reprocessing, optimizing calibration screen, as well as screen design, sound and projection dispatched environmental design. As for sound effects, ‘the giant Chinese curtain’ even better than IMAX, it uses a 11.1 stereo surround sound, and IMAX using a 7.1 stereo surround sound. Meanwhile, the ‘giant Chinese curtain’ of the screen brightness is relatively high, the use of projectors saturation and sharpness is better. 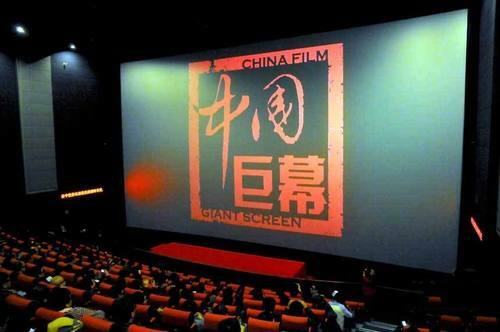 Chinese giant screen does not pick the sources, the brightness by nearly 15% higher than the foreign brands; dual-screen pixel-level image coincides Dexia optimization, increasing the uniformity, color and contrast adjustment function; over 13.1 channel to create high-end stereo enjoyment; China DMR forthcoming normative standards, service will be implemented 7 * 24 hours. (For an interesting further discussion in Chinese about the differences between Imax and Dmax/CFGS see here. If you are using Chrome browser the Google translation option will appear automatically and does a decent job). Second, and perhaps even more worrying for Imax is the fact that CFGS appears to have built up a critical mass of screens to make Robocop 3D a massive hit. “Li Chow, general manager of Sony Pictures Entertainment China, told The Hollywood Reporter. “We are very excited by the success of RoboCop in China. The end of February is traditionally a very slow period for film openings, but Chinese audiences embraced RoboCop due to its great visual effects and the fantastic 3D version shown in China,” said Li.” That is an endorsement of CFGS from Sony Pictures that is almost a poke in the eye for Imax. What Imax will fear now is that CFGS could develop a strong consumer-facing brand. Having largely desisted from using its initial name DMAX, China Film Giant Screen (CFGS) is admittedly a less catchy moniker but could still work well in China and beyond. With its base in China secure and expanding, CFGS will most likely next look at opportunities elsewhere in Asia, in particular in India and South-East Asia where its low-cost business model will find many likely takers. India in particular is no doubt keen on an alternative, after the USD $11 million lawsuit loss by a local developer against Imax in 2008. With Paramount having recently converted Noah to 3D for overseas markets only, it is likely that Cubic is likely to find more work with Hollywood studios keen to ensure a Chinese release for its films but still face the 34-film quota restriction. Given the ownership ties with the government controlled China Film Group, CFGS could thus prove a lucrative way to bypass the restriction. RoboCop was a special case as it was a re-make of an old MGM whose distribution was handled by Sony Pictures. It will be more complex when it comes to a major Hollywood studio release that already has an Imax release pencilled in, not least as Imax does have a significant presence in China and is unlikely to take kindly to studios trying release on both types of screens. Mini-studio Dreamworks’ Need For Speed will be the next title to be released by/on CFGS, though the 3D conversion was handled by StereoD. Interestingly it looks like Need for Speed will not be released in 2D or 3D by Imax, so it will be an important indicator whether RoboCop was a fluke for CFGS or whether Chinese moviegoers’ taste for 3D action films will carry over to the Fast and Furious-type of films as well. RoboCop did play on Imax screens outside of China in 2D, so will in many ways a more telling indicator. Imax is instead showing 300 Rise of an Empire (3D) and Divergent (2D). It will make for an interesting showdown. “Chinese giant screen” projection system independently developed by the Chinese people, the Chinese giant screen does not pick sources, the brightness by nearly 15% higher than the foreign brands; dual-screen pixel overlap Dexia; image optimization to increase the uniformity of color and contrast adjustment function; over 13.1 channel to create high-end stereo enjoyment.